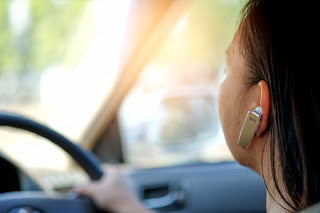 For those of you who are of the opinion that talking on the phone while driving (sometimes with yelling or fighting kids in the back seat) makes more effective or productive use of your time, I doubt you'll change your habits after this one post. But let me share why you'll rarely have a conversation with me while I'm driving—especially a business meeting. Have you ever been in a meeting listening to someone giving a report, or at home listening to your partner share about their day, and suddenly five minutes have passed and you have no idea what the other person has said? Your mind wandered... to what's for dinner, to the dry cleaning you need to pick up before the shop closes, to that ice cream in the freezer that's calling your name. Now recall past driving trips. Have you ever been going somewhere, and maybe because it's a regular route that you drive often or every day, you suddenly arrive at your destination completely unaware of what happened along the way? Have you ever realized, a moment after the fact, that you've run a stop sign or didn't see a car next to you as you changed lanes? Clearly, we are not always mentally present. It's easy to get drawn into what's going on in our heads and miss what's going on around us, even when sitting and facing another person in conversation (or an audience if you're a speaker). When we're not present, we aren't focused. We may listen, but we don't hear. We see, but don't pay attention. We're distracted. Life passes us by. According to the The National Transportation Safety Board, "Nearly 10 percent of traffic deaths involve distracted drivers. That’s about 4,000 deaths that are completely preventable, that never have to happen." "Visual: Takes your eyes off the road. Manual: Takes your hands off the steering wheel. Cognitive: Takes your focus away from safe driving." "Much recent neuroscience research tells us that the brain doesn’t really do tasks simultaneously, as we thought (hoped) it might. In fact, we just switch tasks quickly. Each time we move from hearing music to writing a text or talking to someone, there is a stop/start process that goes on in the brain. That start/stop/start process is rough on us: rather than saving time, it costs time (even very small micro seconds), it’s less efficient, we make more mistakes, and over time it can be energy sapping." One of the most basic things I work on with my clients is being present with their audiences. If a speaker is not present with their audience, meaning focused, in the moment, paying attention to what's happening in the room, noticing the energy, etc., it means they are not connecting. If a speaker is not connecting emotionally with their audience, then they are creating a distance or a barrier, which leads to less engagement and a sense that the speaker is not accessible or approachable. The reason I don't have business meetings while driving is that I know I can't focus on either one properly. If I focus on driving, I can't focus on the conversation. If I focus on the conversation, I'm not focused on driving. How will I remember what we spoke about if I can barely focus on the conversation in the first place? To me, any conversation while driving is a waste of time and energy, because I am not present with the other person. It's hard enough for me to be present during a conversation with my husband while I'm sitting two feet away from him on the couch. How present can I be with a person whose face I can't see, while I'm on the phone, while I'm driving, and while I'm trying not to run over a pedestrian or run a red light? Not to mention the three times the signal drops while going over a mountain or through a tunnel, requiring us to re-start the call several times. You may think you're present. You may think you're good at multitasking. Or maybe you just don't think you have any other time in the day to make this call. I'm very aware of my cognitive limitations while trying to multitask, so I won't have a meeting with you while I'm driving, and I prefer not to attempt to have a meeting with you while you're driving. I'm not as good at being present as I would like to be, but having a conversation in the car is just flat-out saying, "I don't really care about being present for you," and I'd like to at least try harder than that.